Fenton Art Glass was an American company that manufactured handmade coloured glass for over one hundred years. I thought I could picture one of their hobnail milk glass vases at my parents’ house but couldn’t find it when I looked on the weekend. 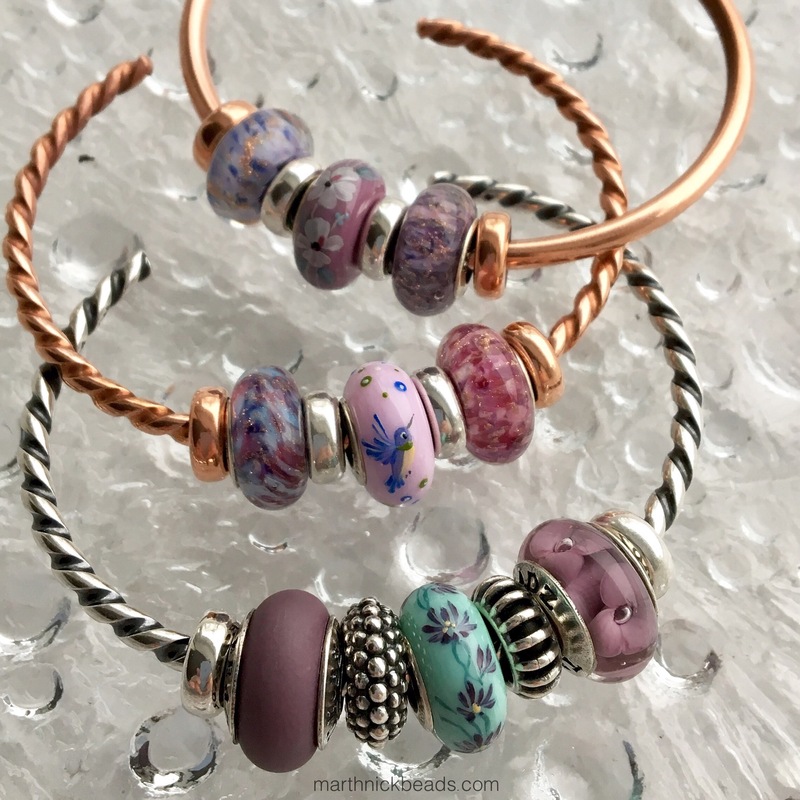 In 2011 they stopped the traditional glassmaking but the company continues to make glass beads and other jewelry in Williamston, West Virginia. 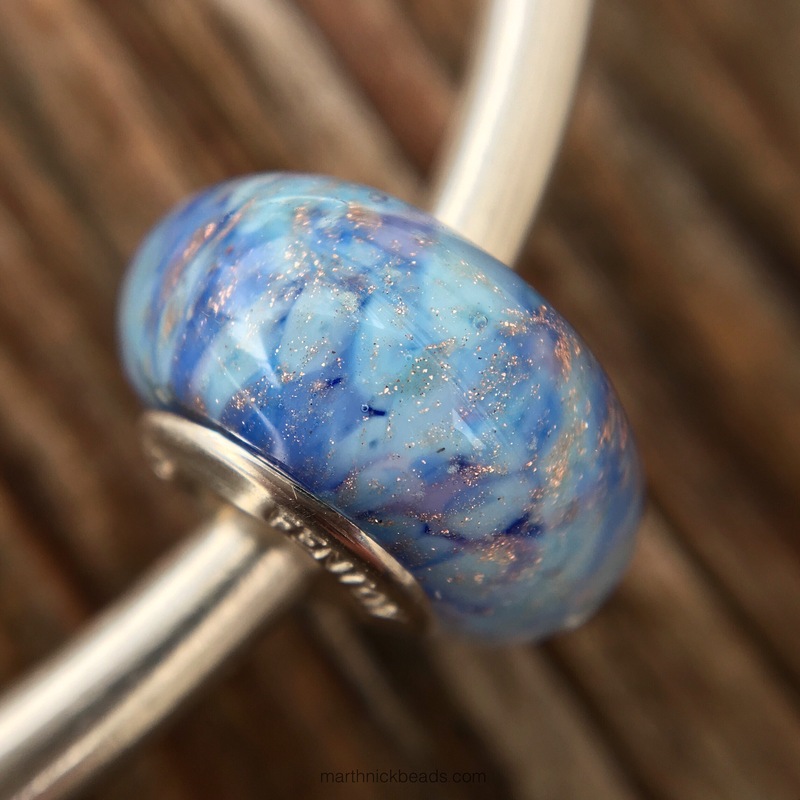 The beads have a large core and will fit on Pandora and Trollbeads bracelets. I picked out a few beads from the Glass Crafted line and Fenton was kind enough to also send some of the Hand Decorated beads. They have an online store with shipping to USA and Canada and Perlen now carries quite a few of the beads, too, with worldwide shipping. The prices range from $35-$45 USD. Let’s jump right in with some of my favourites. This one is called Kindred Spirits. I love the different shades of pink and then the little bit of glitter makes it simply divine. This one below is called Winter’s Jewel Box and is seriously gorgeous. I absolutely love the mix of colours here. It makes me picture Catherine the Great in richly coloured velvets, for some reason. This next bead is called Winter Berries. Again, the way the colours are swirled and mixed around is really lovely and as you probably all know, I love purple! 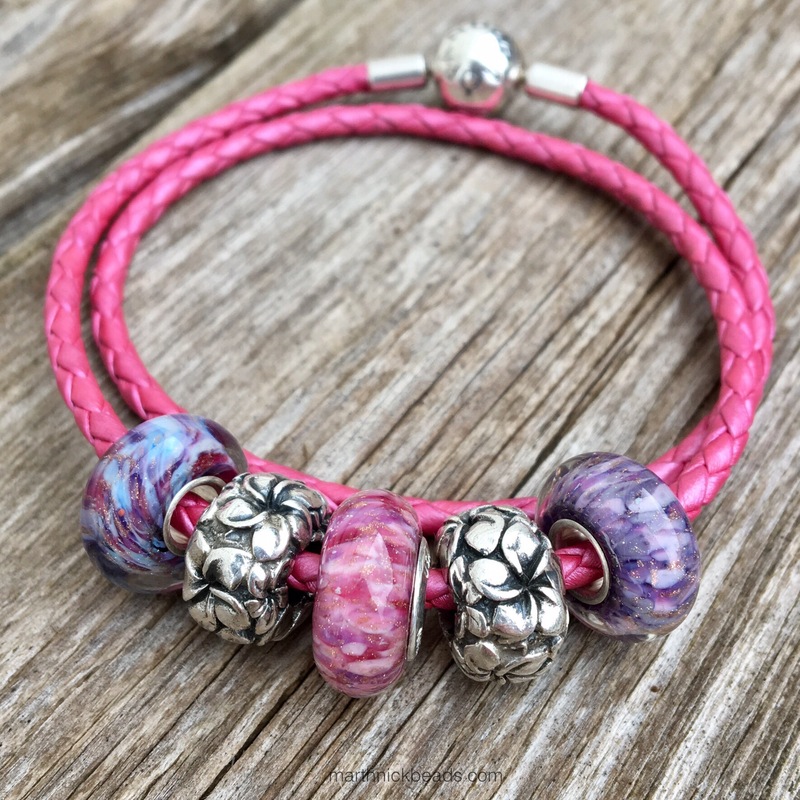 I put these three beads together on the Pandora Honeysuckle Pink leather bracelet and added in a couple of the Redbalifrog Frangipanis Forever. They also mixed in nicely with some True Beadz in the Purple Dream shade, plus an Dancing Fairies Stream (I think!) and a True Taste And Quiet Flows the Don. …and Zhivago, from the Ice Kissed Collection. 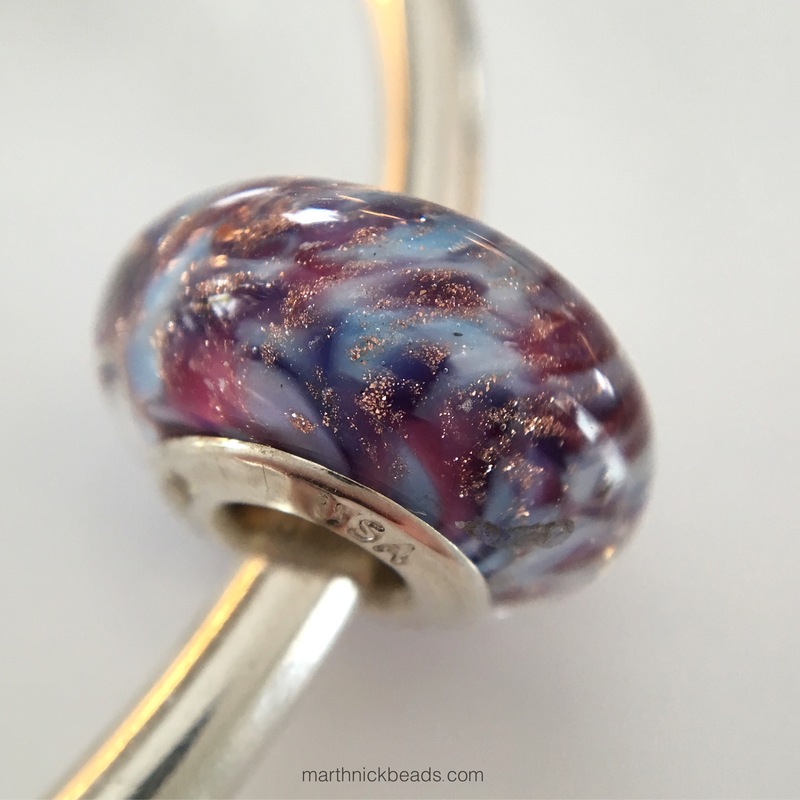 Here they all are on a Trollbeads Bangle. 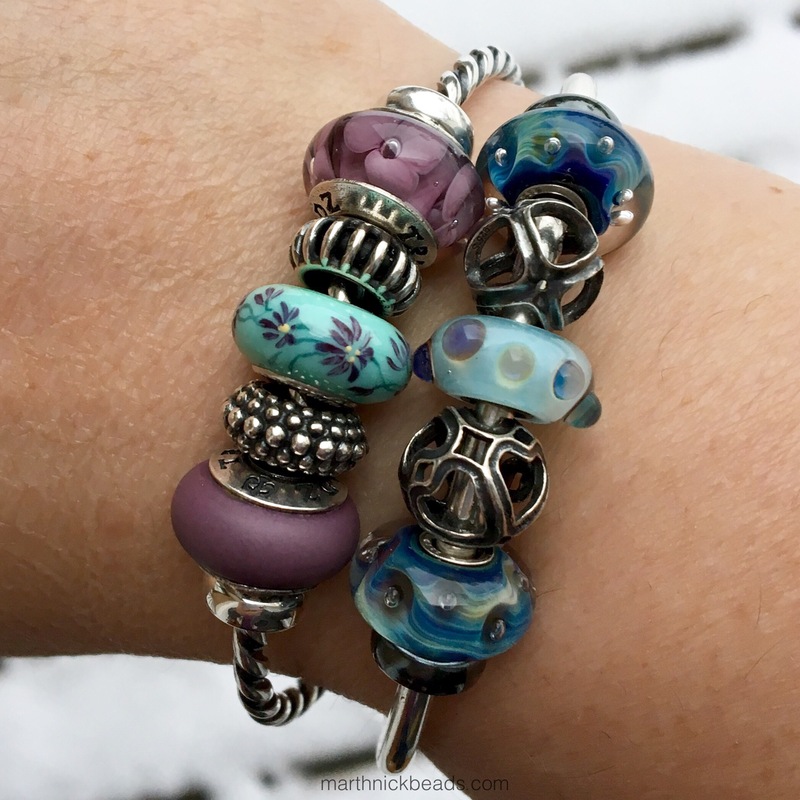 The cores of the Fenton beads are a bit like Chamilia ones, that is to say, one side is like a Trollbead and the other side is more like Pandora. I made a core comparison photo of each side. Left to right are beads by Trollbeads/ Pandora/ Ohm Beads/ True Beadz/ Fenton and Chamilia. Next we have some beads from the Hand Decorated line. This is Bubbles, in a macro shot. 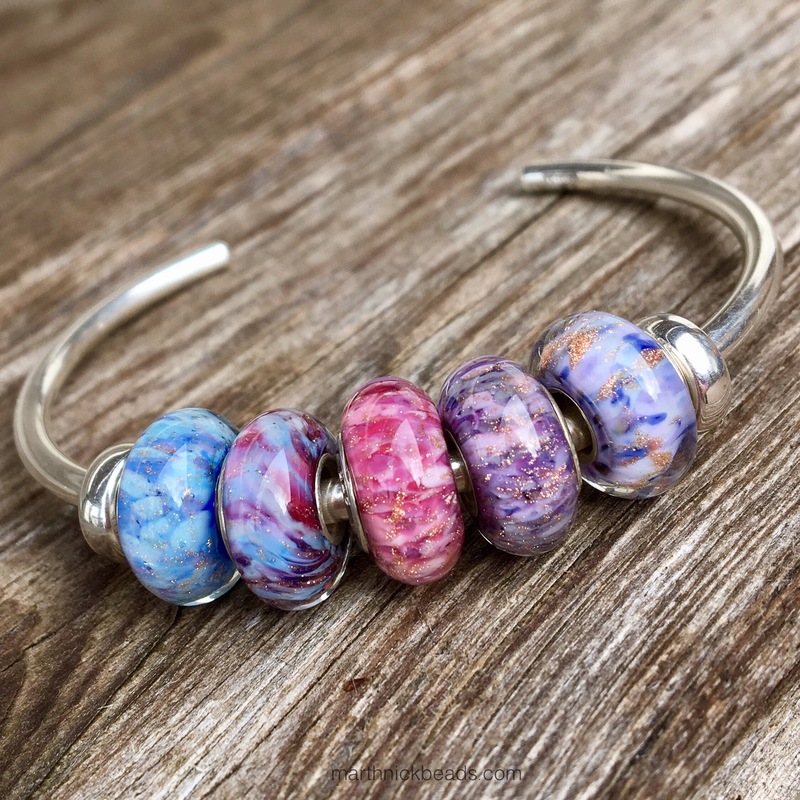 Each Hand Painted bead I have put on a bangle with non painted ones on either side. 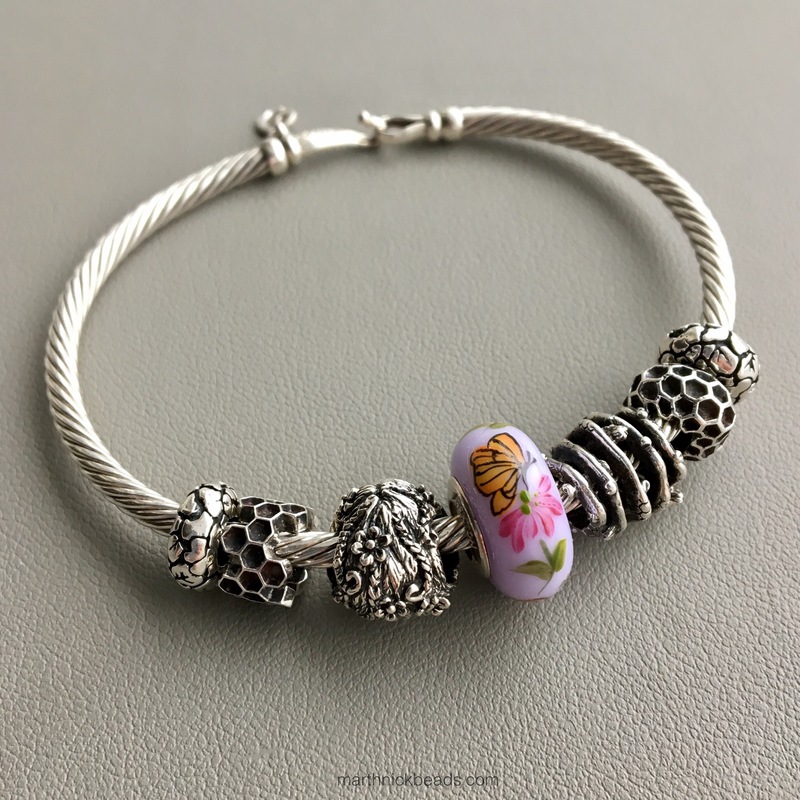 This combo features some Ohm Beads from the Bee Ohm collection and Mama Terra. 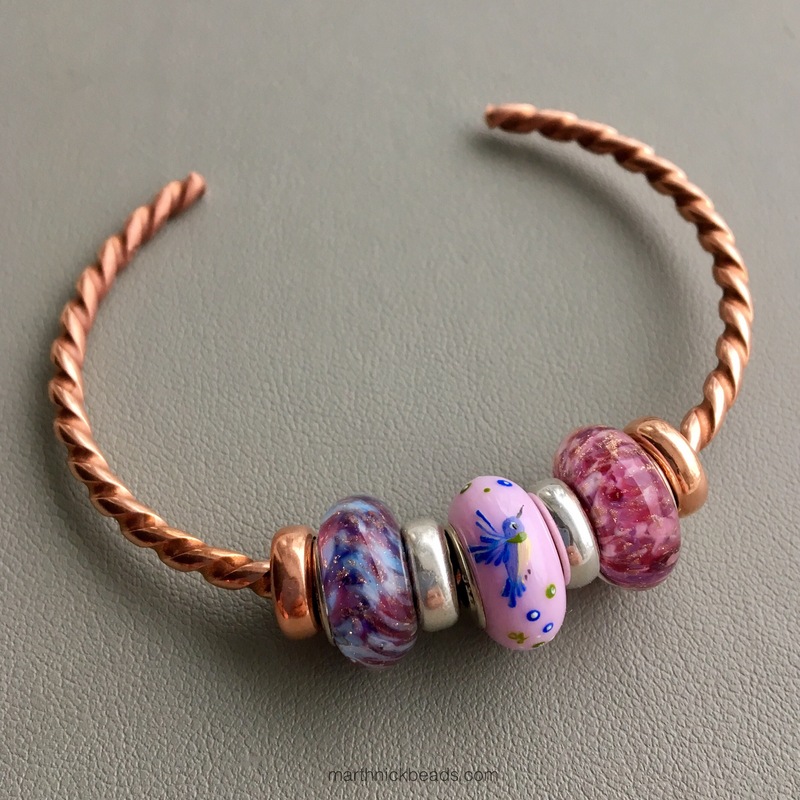 The Fenton bead is called Queen of the Garden. This combo uses two True Beadz from the Purple Dream shade. 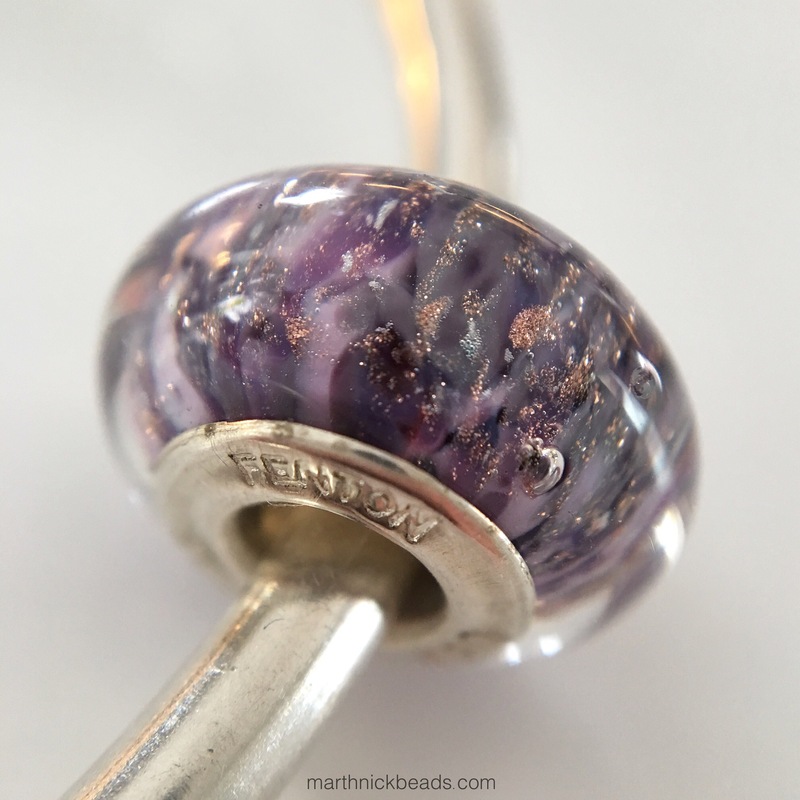 The Fenton bead is called Purple Passion. This might be my favourite combo. 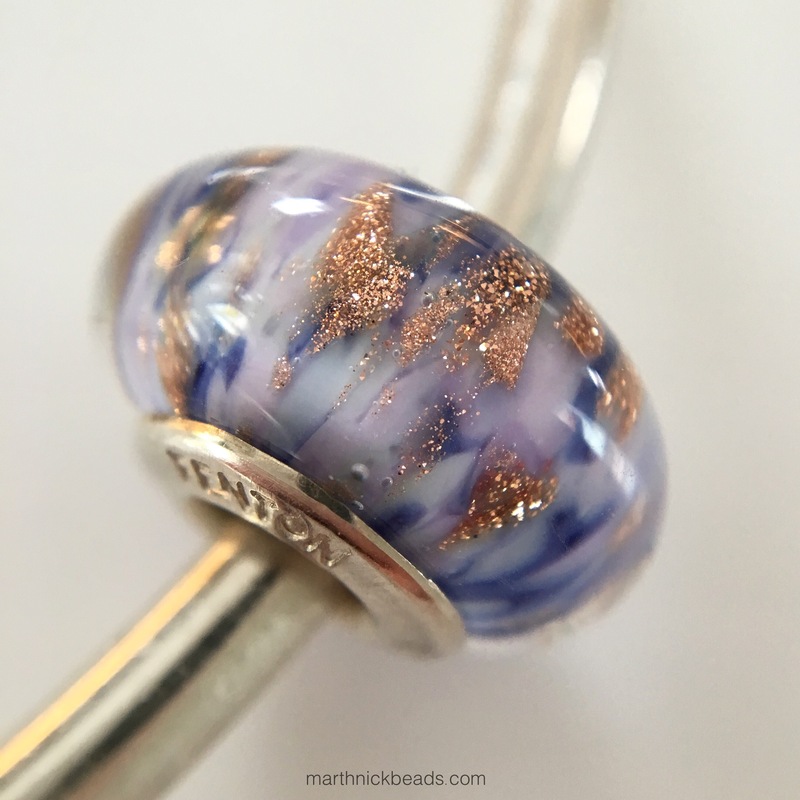 I wore it on the weekend with my new Azure Bubbles Trollbeads. 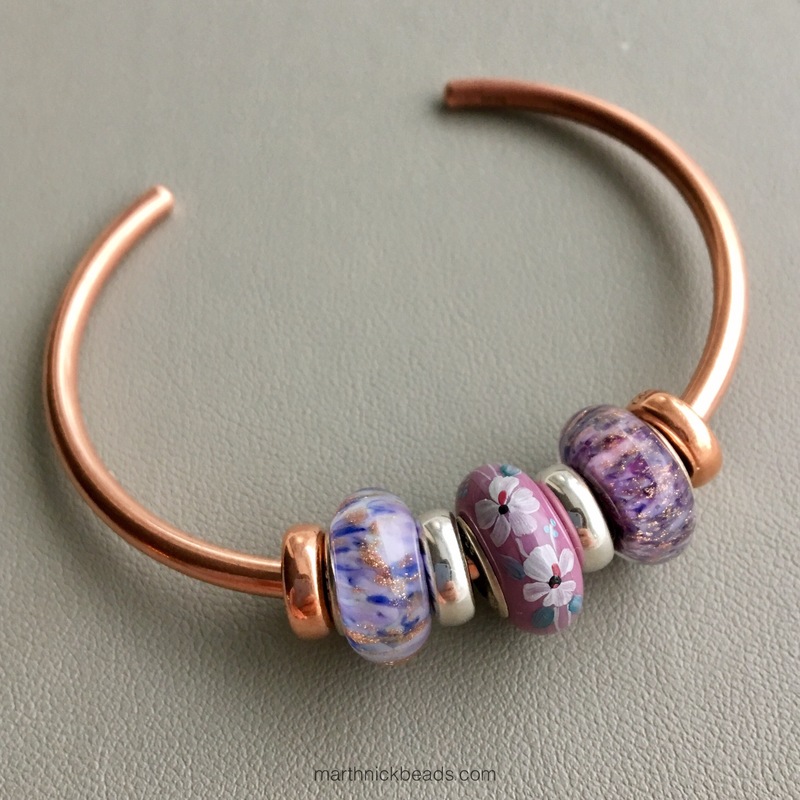 Next up is a real mishmash bangle with stoppers on each end called Hawaiian Floral by Redbalifrog. 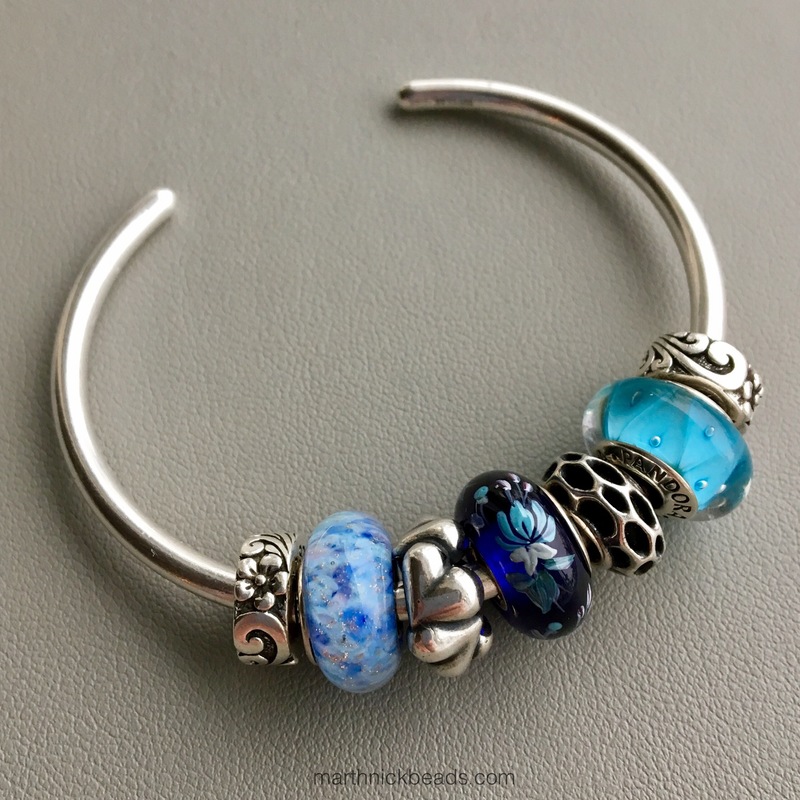 The two inner spacers are from Trollbeads. The glass bead on the left is the Fenton Blue Lilacs and in the middle is Flora Dora. The last bangle has Zhivago on the left, Elegance in the middle and Winter Berries on the right. Here are a few of the bangles together. I think these all mix and match pretty well, actually. I’ve kept them together for a few days and wore a couple of different ones each day, which was really fun! So, I know some people have already expressed interest in these and some people have collected them already. I’d be curious if there are any favourites! What a wonderfully, colour-filled way to begin my day. 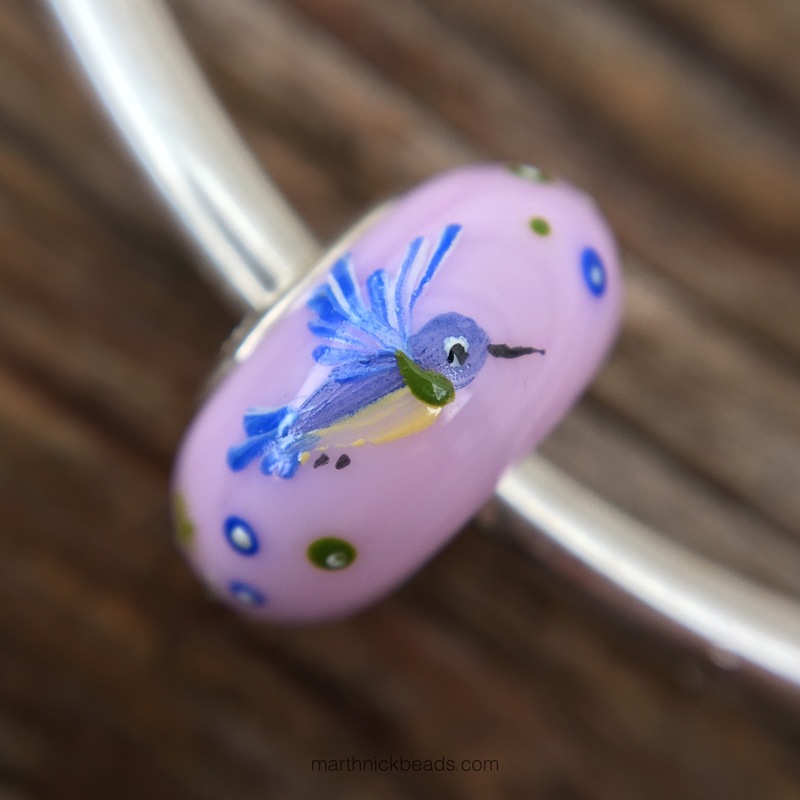 I really like this selection of Fenton glass beads which you choose and the Hummingbird hand-painted one is my favourite of the painted beads. You make them all look totally desirable! 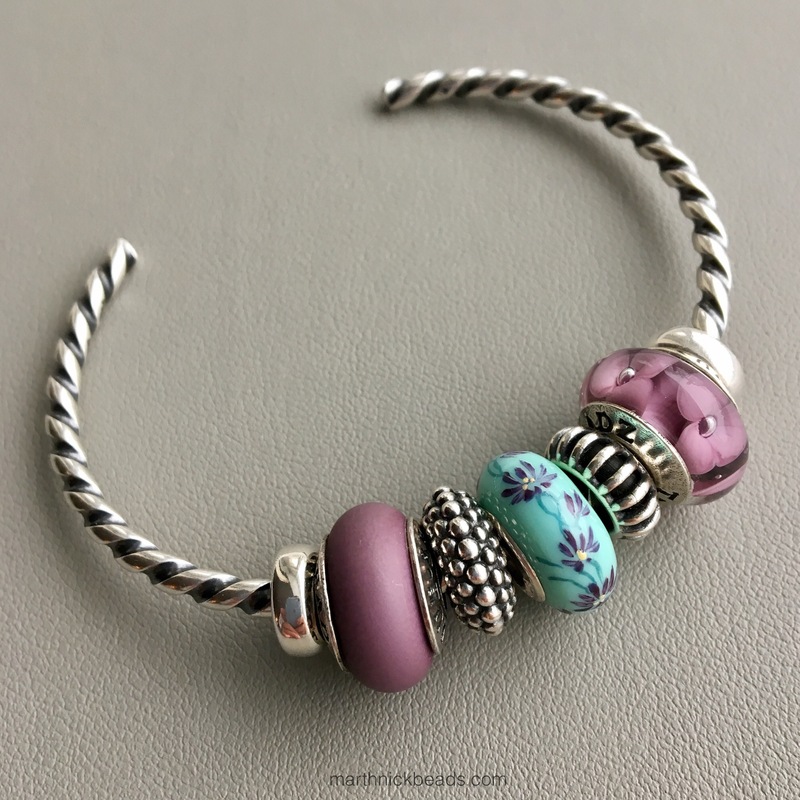 I love the Trollbeads Bangle full of pinks and purples, it’s perfection! 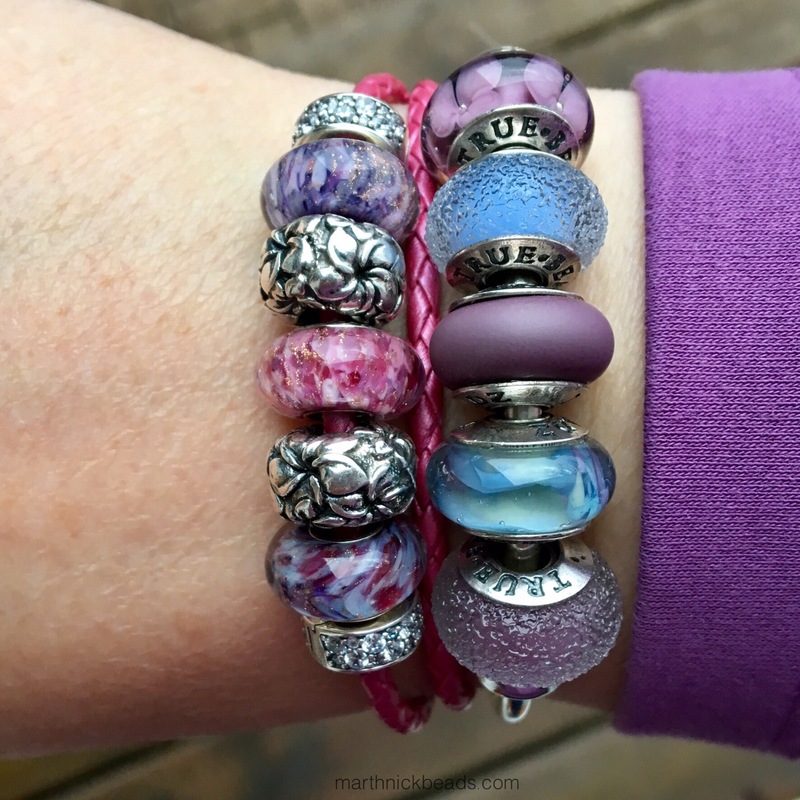 I agree with you, Martha, that my favorite is the bangle with Purple Passion in the middle. It’s a beautiful color scheme. The Honeysuckle Pink leather is very pretty as well. I ordered Kindred Spirits yesterday. It will be fun to see how it fits in with my bead collection. Thanks for the core comparison photos. Good info and beautiful photos as always! Glad you found the photos useful, Dawn. I hope you like your Kindred Spirits! Wow! There is NOT 1 unattractive bead in the bunch, and what a bunch it is. I’m glad you like them, Alex! Isn’t the Blue Lilacs just gorgeous? I will really enjoy using them! The painted ones, is the painted part on the outside of the glass or the inside of the glass? I really, really need all of the pink and all of the purple beads!!! You said they were gorgeous, and I certainly agree with you. I guess I’m starting a new collection now…not that I mind of course. One can never have too many pink and purple beads, I think! Hi again Martha. I just noticed on Fenton’s site that they also have some bracelets I like the silver one a lot. I got the Fenton Heavenly Messenger (cardinal on berry branch with snow against winter sky) for Christmas. 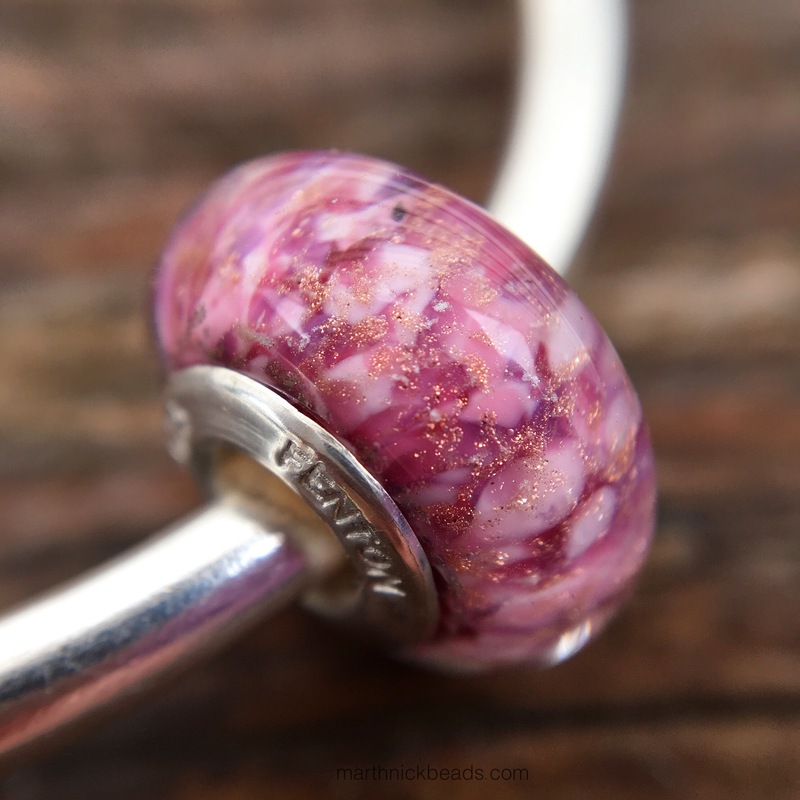 I was amazed by the fact that the bead was so much lighter than my Trollbeads. I would love a comment on the weight of Fenton glass crafted beads as opposed to their hand decorated. I love my bead but its weight scares me… I feel like it is hollow and would be more prone to breaking. Mary, when I get home I’ll try to feel the difference between the two. That cardinal is very sweet! Ok, my son and I just each tried to weigh them with our hands and we agree that the Flora Dora feels heavier than the Queen of the Garden, but that the Flora Dora feels the same weight as a similar sized Trollbead. The glass crafted beads feel about the same as Trollbeads, maybe a tad lighter. Wish I had a little scale as this is just going by feel. Maybe they are made with different types of glass? Carol, I just love that your mom had a glass basket collection! I wonder if that’s partly where you get your love of glass beads from? I can’t wait to play with Blue Lilacs some more. I’d like to try it with some of the Lilac coloured True Beadz. Meant to comment on this the other day and seriously could not decide which I liked best! I think that Blue Lilacs and Flora Dora are stunning and that bangle is gorgeous! Fenton really offers something sprcial here and I will be making my first purchase in the near future. I especially love the cardinals and dark winter glass they offer on their website. Beautiful and classic. Their Ice Kissed collection is really special, I think. It really makes me think of walking around a forest on a clear, crisp day. 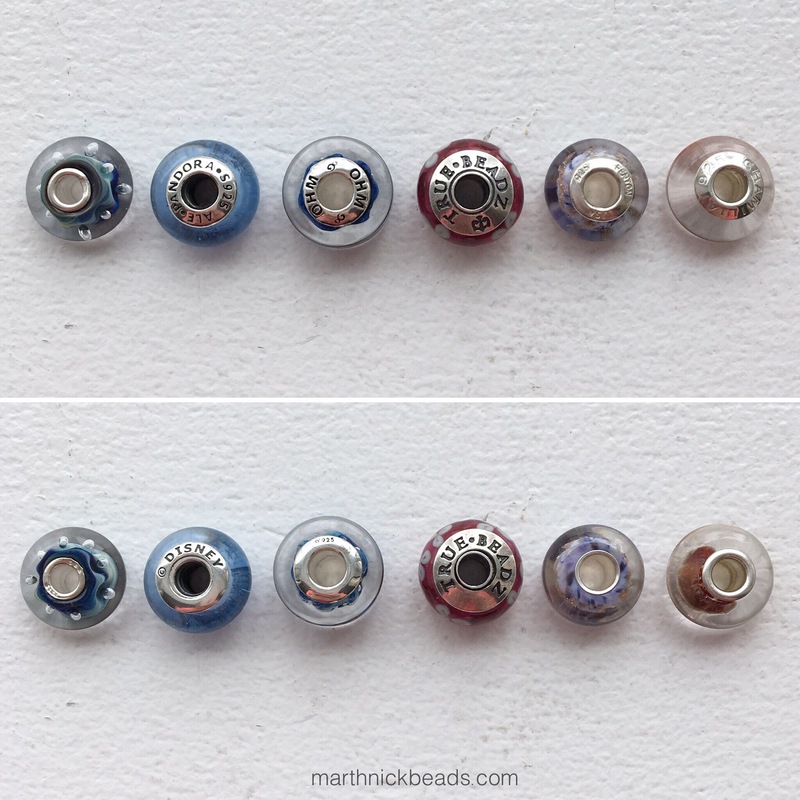 I hope to see some more people with the beads on Instagram, as I think they’re really lovely!